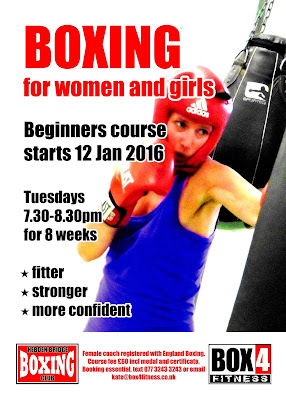 Our first beginner's boxing course of 2016 starts next Tuesday at 7.30pm and runs for 8 weeks. This course covers the basics of boxing and fitness training. Absolute beginners who have an interest in either competing in Amateur Boxing or those who want to benefit from the training, for fitness only. There's always a mixed group of varied abilities and ages (11+), providing an all female, supportive environment. The cost of the 8 week course is £60 which includes a medal and certificate. Booking only, contact Kate on 077 3243 3243.